First, please allow me to extend my warm welcome to all the friends for coming to such a joyful gathering. Today's function is to introduce Macau to you through delicious Macanese cuisine and beautiful pictures of tourist attractions in Macau, making more Indian citizens familiar with Macau and becoming more interested in it. Macauis a Special Administrative Region of China which returned to motherland's embrace just nine years ago. Though it's small in size and population, the unique historical background makes Macau a very special oriental city with fine combination of east and west characteristics. Having the Mainland as its hinterland and Hongkong as its close neighbor, Macau also has an exceptional advantage in geographical location to be a bridge between the two famous tourism destinations, which attracts tourists all over the world to come. Endowed with these rich resources, Macau is borne to an ideal destination for holidaymakers and businessmen. After its return to China, Macau has achieved great accomplishments of rapid economic and social developments under the leadership of the Special Administrative Region Government. In order to promote the development of tourism industry, the Macau SAR government has made great efforts in improving tourism infrastructure including hotels, transportation system, entertainment facilities and so on. A lot of foreign investments have also been attracted. With these efforts, Macau's traditional tourism industry ushers in a new era of development with unprecedented scale. Personally, I had the privilege to visit Macau two months ago. The beautiful scenery and the modern tourism infrastructure in Macau left me a deep and pleasant impression. There, you can find wonderful tourist attractions, grand international hotels, luxury shopping malls and convenient entertainment facilities. You can feel the imprint of the thousands years of civilization of China, and find the culture heritage left by the Portuguese. You can enjoy the delicious cuisine with mixed flavors of China, Portugal, Southeast Asia and maybe also India. I have to say, Macau is one of the best choice for tourists all over the world, in particular from India. In recent years, China-India relations have maintained a strong momentum of development. The bilateral exchanges and cooperation between the two countries have been going on in an all-round manner. Macau, as a Special Administrative Region of China, is also benefiting from the fast-developing, friendly and cooperative China-India relations. 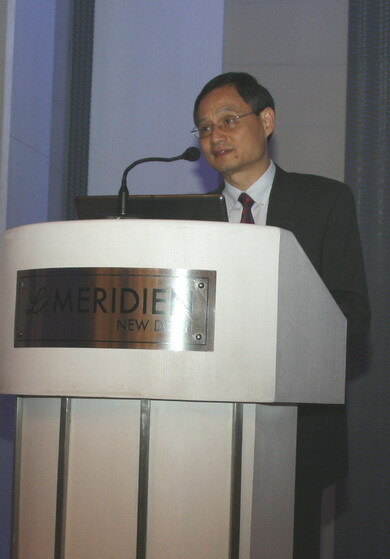 In 2007, Macau received more than 45 thousand tourists from India, a growth of 57.33% from 2006. In the first quarter of this year, there are already 14 thousand Indians visited the small South China Sea facing territory. With the firm support from Mainland China, Macau now is seizing every opportunity to proactively explore the potential of Indian tourism market. It is expected the number of Indians visiting Macau to reach 100 thousand this year. To achieve this objective, Macau Government Tourism Office are undertaking a series of promotion activities. Today's food festival and the launching of radio taxi this afternoon are all part of their efforts. I am happy to inform you that to prepare the food for this evening's festival, 3 chefs came here from Macau to serve the authentic and exquisite Macanese dishes which can give you a taste of Macau. 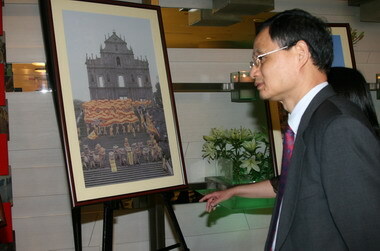 You can also look around the photo exhibition to know more about Macau. However, as Chinese saying goes, seeing is believing. Attending today's function is just a beginning. If you want to find out a true Macau, you'd better go and experience yourselves. I hope tonight's festival will make you put Macau on top of your list of travel plan. I'm sure you will enjoy it, love it and return with a found memory. Thank you for your kind patience. 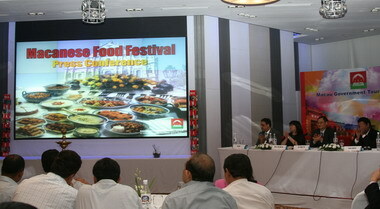 Wish today's food festival a great success!